Medford St. Studios, home to Brooklyn & Boyle, Factory Tattoo artist/inkslinger Luis "Chango" Huffington, artist/inkslinger Erick "Scud" Brenes, fine artist Richard Valdes, the Visions Crew (LAs underground graf stars) and Sierra Leone-reared Sheku Kowai, welcomes you to our first-ever open house. The open house will feature a special limited edition print release and signing of "Night Fall on Brooklyn" by Brooklyn & Boyle February cover artist Michael Rascón. 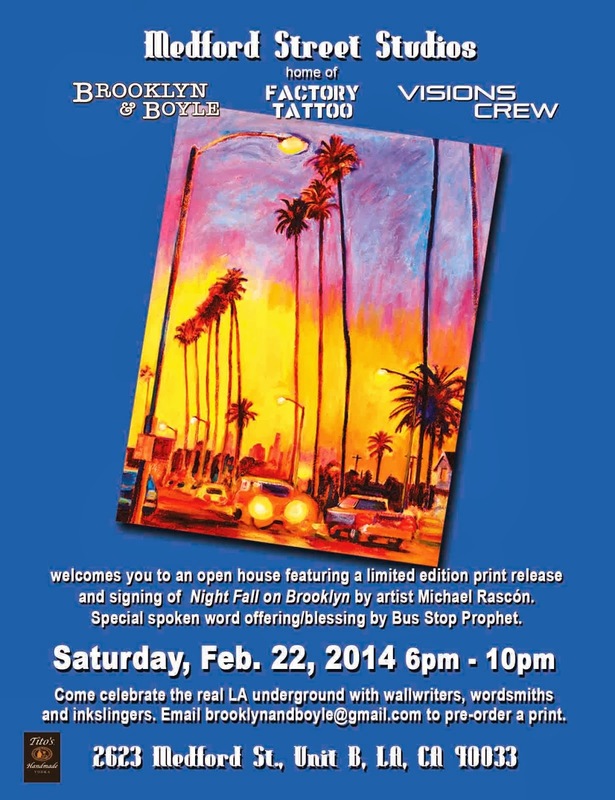 A special spoken word blessing/offering will be delivered by Francisco Escamilla AKA The Bus Stop Prophet Pre-order/reserve your 20" x 26" fine art Rascón print by emailing brookynandboyle@gmail.com for pricing and information. Only 100 signed and numbered prints will be released. Come celebrate the forgotten corner of Boyle Heights with wall-writers, word-smiths and ink-slingers. And join us as well as we applaud artist Fernando Barragan, who has just completed a mural at Plaza de la Raza as the first of ten murals being sponsored by Red Bull through their #latagrafica community artist engagement initiative.